For many people, Oman is a mystery, as research shows that the most popular destinations to travel to in the Middle East are the United Arab Emirates, Qatar, Israel, Jordan, Egypt and Turkey. Thus, Oman is yet to be discovered by exploratory travellers and in recent years the country has been making great efforts to become a Muslim friendly tourist destination. Oman has a rich historical narrative due to its empirical governance under the Persians and Greeks. Islam was adopted during the time of the Prophet Muhammad (peace be upon him) in the year 628 AD. From the 17th century until 19th century, Oman had its own diminutive empire particularly in East Africa. Therefore, Omani culture is a hybrid as it shares characteristics of its Arab neighbours and due its own expansion from the Swahili coast to the Indian Ocean. The deeply rooted history has been the driving force for developing Oman’s tourism industry and the number of tourists, visiting this pearl, increases annually. The country has modern oil reserves unlike their other Arab neighbours. In 2010 they came first as the most improved nation, giving priority to the education of their citizens. Oman is considered as a peaceful nation with a high per capita income and strong currency. Oman has good travel links globally, so travelling from Europe to Oman is relatively simple, either with their national carrier Oman Air or with other Middle Eastern carriers. Abu Dhabi, Dubai and Doha are only an hour’s flight away. 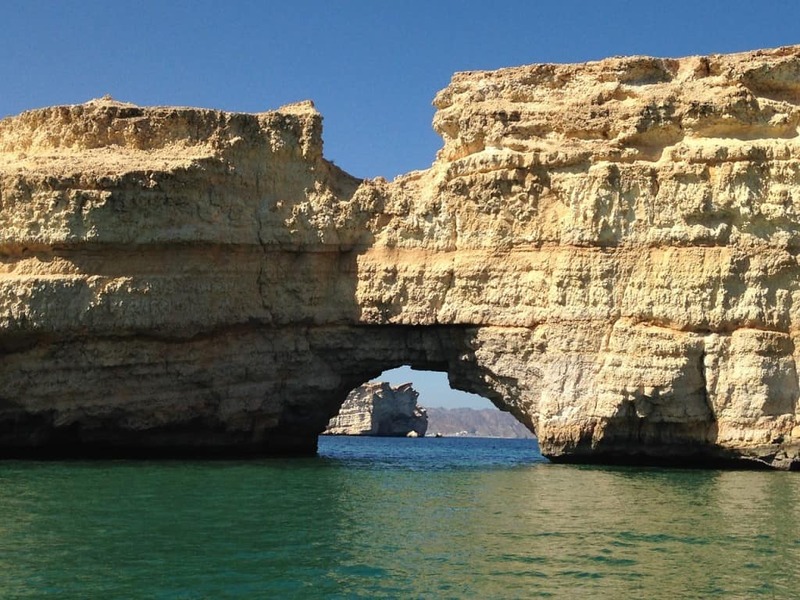 Moreover, Oman is easily accessible by car from the UAE, approximately four and a half hours away. Visas are available on arrival for majority of the nationalities and they cost up to twenty pounds per person. Most Omanis are Muslim with seventy five percent of the population following the Ibadi sect, but not very different from mainstream Islam. Oman is very tolerant of other religions; in fact it has places of worship catering for Christians, Hindus and many other religions. 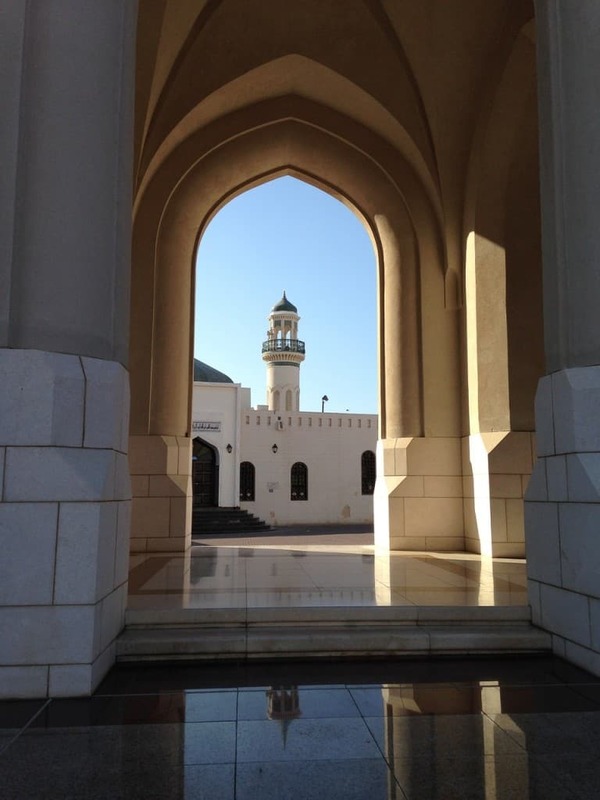 The Grand mosque in Muscat in my opinion is the first place you should visit in Oman. The place is magnificent with beautiful gardens and has a serene feeling. It was completed in 2001 by Sultan Qaboos and can hold up to 20,000 people. 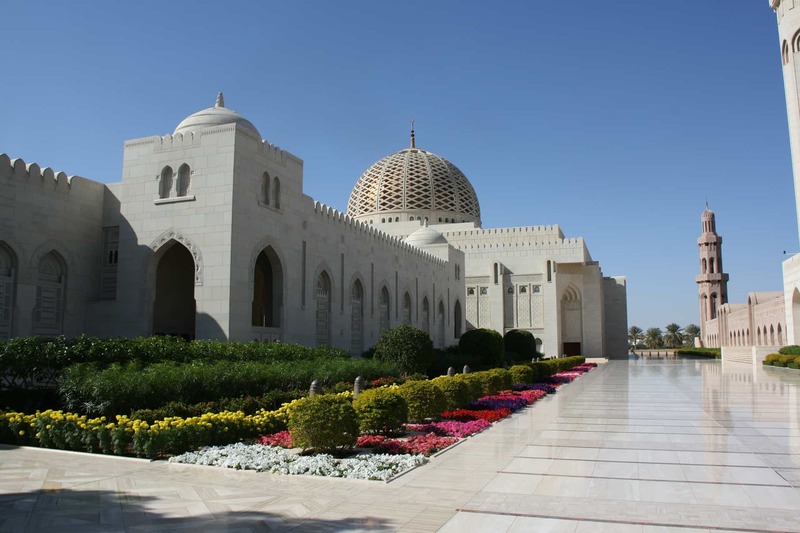 It is formally known as Sultan Qaboos Grand Mosque. The area is immaculately clean and includes a beautiful garden as well as a library where you can spend some time during your visit. There are also tours available for non-Muslims who would like to explore the mosque and learn more about the rituals and the surrounding areas. Also remember that non-Muslims should adhere to modest clothing when entering the mosque, wearing long sleeves and skirts. Mattrah souq is located in the Mattrah area close to the oldest port of Oman and before the discovery of oil there it was the centre of commerce. The souq (market place) is close to the corniche with a nice view of the sea and is visited every year by thousands of ‘cruise ship’ tourists. Muscat is a popular destination for cruise ships and Mattrah is the main port area. You can find many traditional Arabian rugs, silver, gold, traditional diggers as well spices and much more. The shop owners will urge you to come in and buy; and of course haggling is part of the tradition. So make sure you never pay full price. Nizwa city is located approximately 140km from Muscat. It is one of the oldest cities in Oman and once upon a time it was the centre of trade, religion, arts and education. The city is an easy drive from Muscat. You can travel as a day trip or even spend a few days exploring the area. When in Nizwa you should visit the Nizwa fort which is one of the most visited national and cultural monuments in the country. And for some authentic shopping then don’t forget to visit the Nizwa souq market which is the second largest souq after Mattrah souq in Muscat. While you are in Nizwa pay a visit to Falaj Darris which is a UNESCO world heritage site since 2006. 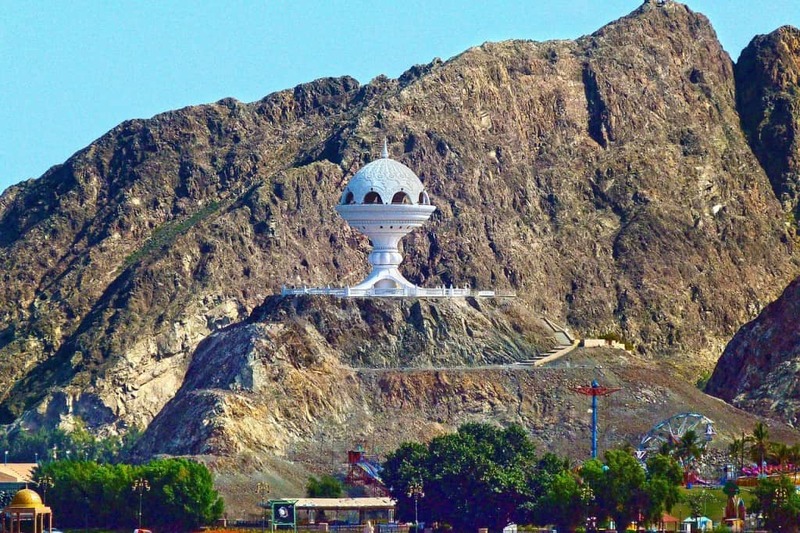 This is one of the largest Falaj in Oman. A Falaj is a traditional water delivery system which came to existence as far as 2000 years ago. Falajs are extremely important for the life surrounding them as they help to maintain human and agricultural life. They are also of significant importance due to their engineering ingenuity in making them some thousands of years ago. Even today the Falaj Darris is significant for the region of Al-Dharkhiliya which includes Nizwa. You can spend some time in the park surrounding the Falaj and enjoy a glimpse of greenery while much of the area is dry. It really helps you appreciate the gifts that our Lord has provided us with. While in the region of Al-Dharkhiliyatake take time to visit a hidden gem of history, the town of Misfat al Abreyeen. This is by far my favourite place in Oman surprisingly it is not very well known to tourists although it is astonishing. The rocky canyon town of Misfat Al Abriyeen is close to the rural town of Al Hamra, and not far away from Nizwa. It literally gives you a glimpse of how Arab tribes use to live in ancient times and how they sustained themselves. The most striking features are the ancient houses perched on top of the mountains. There are date palm trees and greenery on the mountain which is a rare sign for Oman’s landscape. The reason behind this greenery is the actual falaj that runs through the village and ensured the sustenance of the inhabitants. Even today there are still parts of the village that are occupied. I would highly recommend for you to spend a few hours with your family in the area and take a short history lesson too, as environment could have not been more befitting. Make sure you wear comfy shoes and you have plenty of water as the area is hilly and there is a lot of walking required. Wadi Bank Shab near in the Al Sharqiyah region is a must see for any tourist, which I unfortunately discovered too late.It is less that 2 hours drive from Muscat and it makes a great day trip. There are some hotels available and also camps for those who are more adventurous. ‘Wadi’ in Arabic means valley or dry riverbed which contains water only during times of heavy rains. 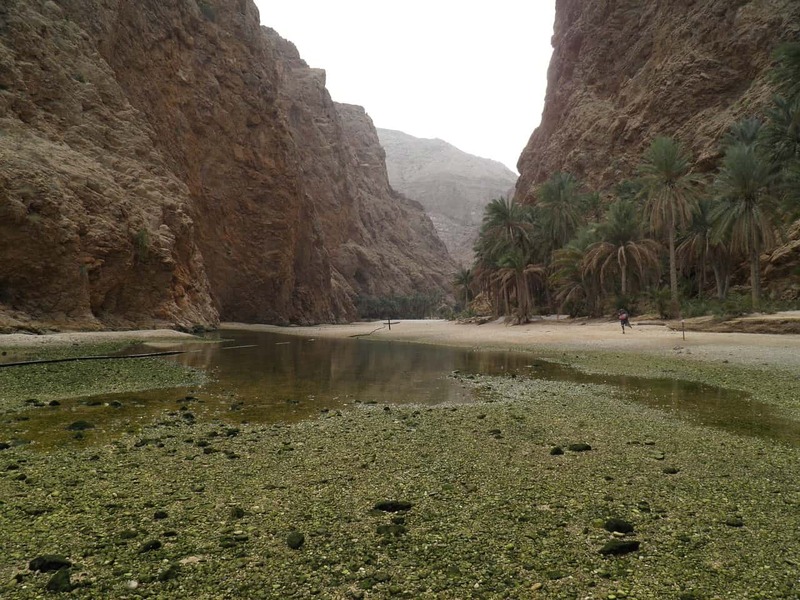 According to Lonely Planet Wadi Bani Shab is one of the most popular and breathtaking destinations in Oman. You can see waterfalls, greenery, terraced plantations and aquamarine pools which you can discreetly swim in. There is also a boat trip that can take you around the wadi making it easier for you to see the beauty of the nature up close. Finally there is an option to visit a partially submerged cave. If you would like to visit the main attraction of the waterfall and cave then you will require a 30minute hike and also a swim through the natural pools in order to reach the waterfall via the submerged cave. Oman is one of my favourite Gulf countries. This is because not only does it contain a lot of tradition, it is also modernised, but not at the expense of its cultural or natural beauty. Oman is one of my favourite Gulf countries. This is because not only does it contain a lot of tradition, it is also modernised, but not at the expense of its cultural or natural beauty. I highly recommend you to visit Oman while its traditions and historical sites are still intact. One of the beauties of being a Muslim is the fact that we are encouraged to travel and admire the beauty that Allah SWT created for us. One of my favourite aspects of travelling and praying as Muslims is the fact that each and every place will testify on the day of Judgement that we have been there and praised our Lord. Let’s make more and more places testify for us rather than against us. Climate: Very hot and humid summers reaching up to 40 degrees celsius and pleasant winters bordering a Mediterranean climate rarely climbing much above 30 degrees Celsius. Best time to travel: Depending on the individual, the best recommended time to travel for a summery breeze and winter sun is between November and March. This is to allow tourists to explore easily, preventing them from feeling too hot or cold. Or if you do not mind the Omani heat, travel between August and October. This is a travel guide written by me for the Traveller’s Guide section for the Ilma Magazine Issue 15. You can view and read the full beautiful magazine for free here. I visited Oman a few years ago and enjoyed my time there! I’m no foreign affairs expert but I really hope the troubles/issues in Yemen won’t go across the border to Oman. Your article reminds me of my trip to Oman, Elena. I have written plenty of articles pertaining to Oman — I am not finished posting my trip reports by any means; and I am not linking to all of those articles here — and it was indeed a surprising country to visit. When I booked my flights to Oman, everyone asked me “Where?” or “What?! ?” as few people here in the United States have ever heard of Oman.